It's a family of foxes in the forest! Your child will have fun coloring in this detailed forest scene. How much do you know about the Snowy Owl? Learn a few fun facts about this species with a fun sheet, including a dot to dot! This great memory match game is perfect for animal lovers and jungle safari adventurers alike! Color the Namib Desert Beetle crawling along the Prickly Pear Cactus plant. 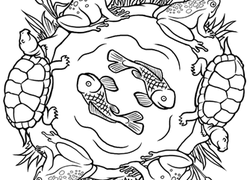 Inspired by the symmetrical art of the mandala, this pond-life coloring page features fun animals like turtles, frogs, and butterflies. This underwater coloring page features a manta ray surrounded by fish and coral, a fun coloring page for any child. Did you know North America has native panthers? Learn a bit about this giant wildcat with this coloring page! This coloring page dot-to-dot uses skip counting as an unexpected way to tie in multiplication learning and reviewing multiples of three! What's this silly bird doing? Meet the Dodo, a big bird that has been extinct for hundreds of years. Animal lovers, here is a great matching game for you! Introduce your child to a few exotic rainforest animals with these match and memorize cards. This isn't your average coloring worksheet -- you'll have to count out syllables to figure out how this plucky bird should be colored. Did you know there are tiny owls? Learn all about the Elf Owl with this fun page, including a word scramble with words from the fun facts box. Can you connect the dots to complete the picture and find out what is lurking in the water? Hint: It's got eight arms. That's a lot of dots! Do you have a little animal enthusiast on your hands? Give your child a great matching game featuring rainforest animals! Looking for a way to boost your student's memorization skills? Here's a great rainforest animals memory game that doubles as a coloring page! This grizzly bear dot-to-dot gives your kid an extra challenge by asking him to count by multiples of four. Work on this grizzly bear dot-to-dot with your kid. Ready to give your white crayon some love? Print out this snowy owl coloring page!